The 1960's was a turbulent time for Hamilton. Earlier in the decade Hamilton acquired a couple of Swiss companies... the first being Hugenin Freres and the latter being Buren. Both companies were based in Bern, Switzerland. 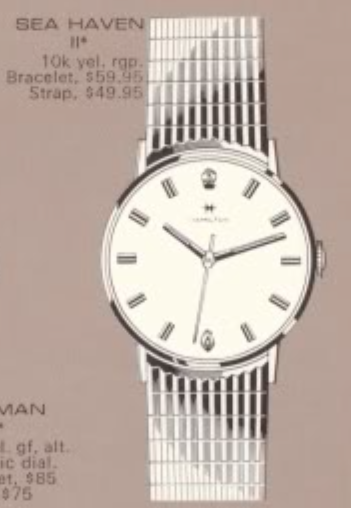 In fact, it's not unusual to occasionally see Hugenin watches with an H- logo similar to the H-logo Hamilton used in the 1960's. As is sometimes the case, the master became the servant and Hamilton's acquisition of two Swiss companies was a premonition of Hamilton's eventual acquisition by a Swiss company in the early 1970's. Hamilton didn't go down without a fight though and new models were introduced all the way up until the end of US production in 1969. One of the last new models to be introduced was the 1968 Sea Haven II. It was only produced for two years. Based on the general shape and the details of the dial, the Sea Haven II could easily be mistaken for a 1964 Sea Ruler - although the Sea Ruler has a faceted crystal and slightly different lugs. The Sea Haven II came in a one-piece 10K RGP case. Tucked behind the white dial is a Hamilton 688 movement, a 17 jeweled Swiss grade made by ETA... basically a manual winding version of the 689 automatic movement, with which it shares a lot of parts. I recently scored a nice Sea Haven II project watch. 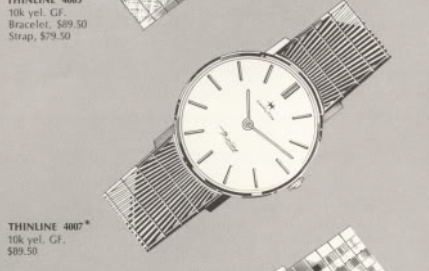 It drew my attention because I thought it also came with it's original bracelet - but on close observation it's not quite an exact match since the catalog has straight lines and my project watch has lines that fan out. It was a little bit of a risk because it was missing it's crown, which means it was also missing the male-portion of the two-piece stem. You never know what else could be wrong with a watch that has an open hole where the crown ought to be. The case back is unengraved and looks pretty good. I don't think this watch saw too much wrist time. The 688 movement looks no worse the wear from not having a crown for so long. In fact, you can see by the blurred balance wheel that the watch is running. This is a tricky movement to reassemble, thanks to the train bridge that requires four pivots to be perfectly aligned. That is much easier said than done. Everything is cleaned and dried. Manual winding movement have much fewer parts than automatics. Putting one together may seem daunting - but compared to an automatic, this watch is a breeze. Thanks to my timer, I can see that something is preventing the watch from running cleanly. It could be some spec of crud on the hairspring but close inspection will be needed to diagnose the issue. Based on the distance between the two lines, I'd say the beat error is a bit high, even though the timer can't discern the beat error, thanks to the extra noise. The 688 has an adjustable hair spring stud location so I can easily tweak the beat error and get the two lines to collapse on each other. However there is still too much noise to give this watch the green light. Re-cleaning the hairspring did the trick and a little more fine tuning of the hair spring stud brought the beat error right in line. Here's an interesting nuance to reassembling a watch... the setting wheel often have a top side and a bottom side. The bottom side is often chamfered and you need to put the chamfer side down or the setting will feel "crunchy" when you set the time. A new crystal will do a lot to improve the watch's already decent appearance. Well, with the dial and hands reinstalled and a fresh crystal to protect them, this watch turned out to be very nice. There's a hint of wear to the inside of the lugs, thanks to the bracelet. Since it's not the correct bracelet I may swap it out with a nice strap. I did a nice job fitting a new stem and crown... they look like a perfect fit. PS: the bracelet would be a good match for a Thinline 4004 or 4007 - so I'll have to keep an eye out for one of those. Very cool! I just scored the same watch and your article is fascinating.